Composer and performer Ray Ashley was born and raised in New Jersey. He played saxophone and piano as a child, but was mostly self taught in basic musicianship. When all the other kids were listening to 70's AM radio, Ashley was exploring the Beethoven symphonies. "I remember when I discovered the fifth, it had a power and depth I had never experienced in music before." he rememebers, "The great thing was, there were eight others to explore, and each one was a unique journey of discovery for me. That's what I liked about the classical composers, these guys wrote all this music and it was like they never had a bad day. While pop groups might put out a second-rate record, Beethoven, Schubert, and Mozart always batted 1000!" Though he is quick to point out that he never went through the "meat grinder" of a conservatory, he studied harmony and orchestration under Tom Ross and Hillary Tann (at Union College), and jazz theory with itinerant NewJersey musician Frank Jolliffe. Ray's earliest band experiecnes were gained playing bass and keyboards in cover bands like The Screwdrivers and The Attic Rats. It was with the 'Rats that he learned the fine art of extended improv, a-la Grateful Dead. Later, he worked in one of the later bands led by post-punk experimentalist Lord Byron Von Erect. This was his first experience with a band that wrote its own songs. "Byron was a real inspiration", Ashley reminisces, "He showed me that you can get up on stage and do anything, absolutely anything, so long as you do it with conviction. I probably never would have started singing and writing original songs with lyrics if it wasn't for him". It was also during this stint in The Spaz (Byron's backing band) that Ray first met drummer Joe D'Andrea, with whom he would work more extensively later. Ray firmly believes that musicians, like journalists and writers of the 'great American novel', need to have a life outside of their art in order to give the art vitality. Ray has done extensive research in the natural and chemical sciences, and spent several years at sea with the Navy. It was during this time that he went through many breakthroughs with his art. "I was writing songs in what free time I had. If you've worked 22 hours straight and then you go off to an empty machinary room to work on your songs with an acoustic guitar, you really pour your whole soul into it. On the one hand you are trying to keep your head straight, wired on coffee, while the rhythm of the engines provides you with your accompaniment." Young Lieutennant Ashley also was given an extensive background in oceanography: "Listening to the sonar signals, hearing the whales and dolphins and whatever else was down there in the deep black unknown - the ocean acoustics really gave me a profound understanding into the interaction between matter and energy". So deep was his love of the sea that Ray might have made a maritime career for himself, if not for a profound experience he had back at home port in Norfolk. "I was out at a tiny local bar called Cogan's Instant Art, and a touring national act was playing. The band was called Southern Culture on the Skids (they are still going strong in year 2000 - ed.). They were looking for an audience volunteer, and I was up there in a flash, playing maraccas with them for a few numbers. Of course I'd been on stage before, but it had always been a college, tame kind of frat party thing. This was a black light city bar with sweaty audience members packed up to the edge of the stage. The band had worked the crowd into a frenzy and here I was right in the middle of it. I knew right then how I wanted to spend the rest of my life. They finally pushed me off the stage when they realized I didn't want to leave!" In 1993, he was back in New Jersey playing the instrument called The Stick® In another black light city bar. This time the bar was T-Birds, the city was Asbury Park and the bandmates were Joe D'Andrea and a violinist/performance artist called "Kelly Q". This band, called Torq, played a number of gigs around the shore area for about a year. After the departure of Q, Ray and Joe continued on and made a groundbreaking Stick and drums cassette called Mostly Mono. It was essentially a 25 minute prog rock demo with punk rock sensibilities. Supporting this record, they gigged as a duo in bars in New Brunswick, NJ, Asbury Park, and other parts of New Jersey. Around this time, Ray was also playing bass with a legendary local jam band called The Other Way, which has since dissolved. Since 1997 Ashley has divided his time between his main band Three Hour Detour (with D'Andrea and violinist Helene Zisook) and side projects like the Smoke Detectors and the Cinema Inferno Orchestra. Three Hour Detour makes regular stops in bars and coffee houses in Philadelphia, New York, and Southern New Jersey. 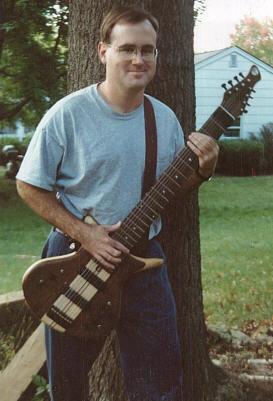 He has since left the Stick behind for the Warr® Guitar and the tapping guitar made by ADG. On these instruments he gets the full range of guitar tones from low bass to high leads. In live shows, traditional song forms have existed as frameworks for massive improvisations up to 30 minutes in length. Three Hour Detour and Cinemea Inferno have each produced recordings. Ray Ashley has spent a great deal of time playing the traditional Mbira DzaVadzimu of Zimbabwe, and seriously studying the large body of Shona music created around that instrument. "Learning the music of another culture is like learning a foreign language" Ashley notes "When I was studying the Russian language I gained an understanding of English syntax for the first time. In a similar way the study of Shona music made me really come to grips with the nuts and bolts of music itself, how we perceive melody, rhythm, and counterpoint. It is especially important to approach any non-European music on its own terms, and in its own cultural context, not as a variant of a so-called European norm". In addition to two CD's of original songs, he has composed one string quartet and one symphony. He performed some of his original compositions in Europe for the first time in the summer of 2000. He is a scholar of the music of the Danish composer Carl Nielsen, and is planning further travel to Europe to conduct further research on Nielsen's music. He currently resides in the Princeton, New Jersey area. "Stick" is a registered trademark of Stick Enterprises Inc., with which the authors of this web page and Ray Ashley have absolutely no affiliation. All other trademarks are the property of their respective owners.